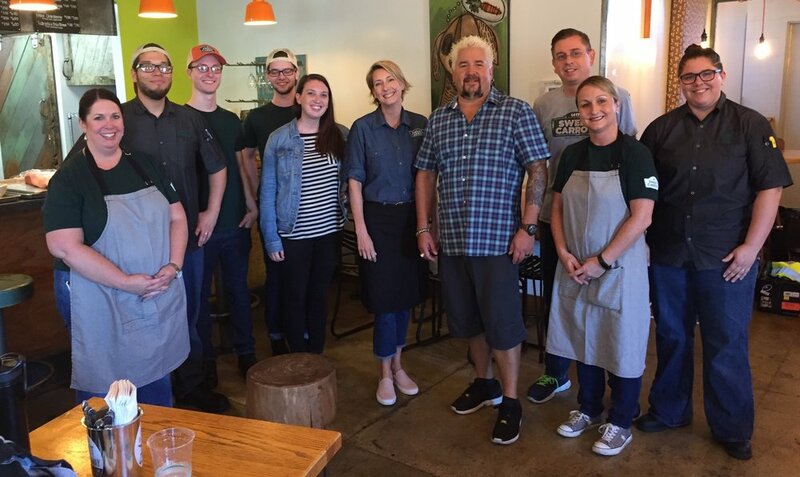 Guy Fieri rolled through town and stopped at Sweet Carrot! Want to hear what he had to say for yourself? Our episode is available to watch on The Food Network. Simply log in using your cable or satellite provider credentials to view the episode on-demand. A Sweet Carrot Classic! A tasty, griddled corn cake topped with brisket, smothered with slaw, our off-the-hook corn salsa and house BBQ sauce. Sweet buttered roll sandwich with Ohio chicken meatballs. Smothered with slaw, our off-the-hook corn salsa and sesame ginger sauce. Can't get enough of the Food Network? Check out our episode and more about Diners, Drive-ins & Dives.